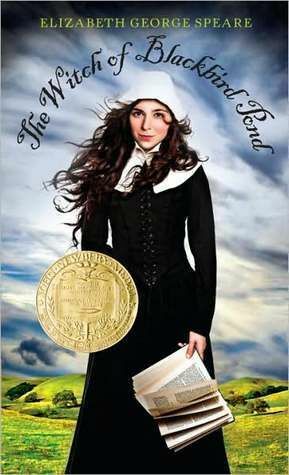 When I was making selections on books to read from the 1950s Newbery winners and honors, my two oldest girls encouraged me to read The Witch of Blackbird Pond by Elizabeth George Speare. So with that trusted recommendation, I made sure to put Blackbird Pond on the top of my list as I wondered why I had never read it. We join Katherine Tyler (Kit) as she journeys from her free-spirited life in Barbados to the quiet, structured life in the Puritan Connecticut colony. For the girl who was pampered by her grandfather, read and enjoyed Shakespeare freely and lived a life full of color, the changes are difficult. We must admire Kit’s determination to be a help to the family who has taken her into their home. She clearly does not fit in this community and there are those who view Kit as an outsider. As Kit struggles with where she belongs, two friends are found. One is an elderly Quaker woman viewed with scorn by the community and a young Puritan girl who is mistreated. We see beautiful friendships flourish between these three.This friendship is put to the greatest of tests when one is accused of being a witch. I was expecting The Witch of Blackbird Pond to be a story of the witch trials during this time. What I found was a story of friendship, love, and sacrifice. I enjoyed the simple manner of the story and how we see all sides, not just Kit’s. We not only see Kit’s struggle to fit in but we see the compassion of her Puritan family as well. All stories have more than one side and I think this is the understated beauty of this book. My daughter (11) happens to be studying this time period in history so I happily passed The Witch of Blackbird Pond to her. She found it an enjoyable read as well. This book is well suited for ages ten to twelve. This entry was posted in Book Reviews, Books and tagged Books, history, literature, reading, review by sweetie. Bookmark the permalink. Wonderful book and a good lesson for me not to judge a book by its title as I put off reading this book for quite a while because of a wrong impression. I read it aloud a few years ago & we all enjoyed the story. I, too, thought this was a book about the Salem witches. Thank you for an excellent review the encouraged me to add this book to my TBR list. We just finished this as our read aloud. Very good book.